Nothing radiates a youthful glow and improves your overall appearance quite like a whiter smile. General, restorative, and cosmetic dentist Dr. Cofer can provide you with professional-grade take-home teeth whitening kits personalized just for you. 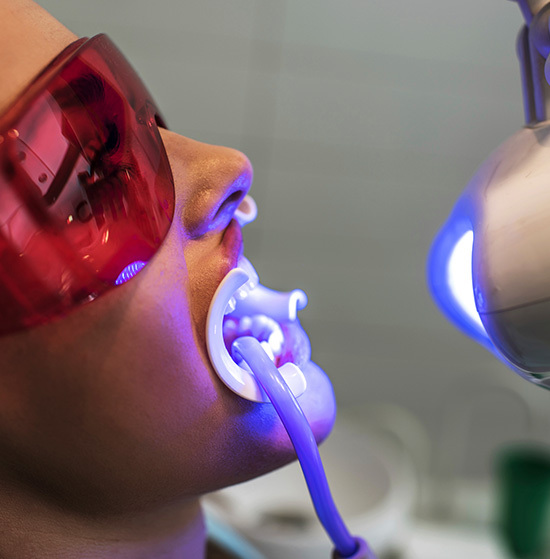 GLO Teeth Whitening is the most effective whitening treatment option available on the market today, capable of whitening your teeth by up to eight shades in under an hour. Even the most persistent stains, such as those caused by coffee, tobacco, red wine, and tea, are lifted from your enamel and dentin, revealing your whitest smile yet. You’ll love the confidence that comes with knowing that your smile looks its best and is completely free of discoloration and shining brightly. With our custom take-home whitening trays, you can easily maintain your results for years to come. With our custom take-home whitening trays, you can easily maintain your results for years to come. Take-home teeth whitening gives you the ultimate in convenience, allowing you to whiten whenever and wherever you want. We create bleaching trays that fit your teeth perfectly, giving you even coverage and protecting your soft tissues from the bleaching agent. You simply take your personalized kit home and spend a little time each day wearing your trays. After three or four days, you should start seeing results. Take-home teeth whitening has been shown to provide consistent and predictable improvement, and it’s completely safe when used as directed by your dentist. If you live in Waco, Robinson, or Lorena and find yourself wishing for whiter teeth, contact Premier Family Dental today for an appointment. More beautiful smiles begin with professional, personalized attention from a cosmetic dentist who knows what individual smiles need to look their best, and that’s exactly what you’ll find when you visit Dr. Cofer in Central Texas.